To celebrate AIGA’s 100th birthday in 2014, we’ll occasionally feature posts from some of our most established members. In the case of Karen Sessions, she’s been a part of AIGA Charlotte from the very beginning. For 25 years Karen has helped manage teams. At First Union (now Wells Fargo) she managed the design department within the Corporate Communications division; she then owned the design firm Perry Sessions Design for 13 years, and since June 2010 she has helped manage the 35-person creative team at Elevation Church. Here is her tale of how AIGA Charlotte was created. Rhythmic, loud music pumped through the air. I was sitting on the edge of my seat in a massive auditorium surrounded by hundreds of design professionals. Names of well-known designers flashed across a big screen like celebrities with icon status: Stefan Sagmeister, Jessica Helfand, William Drenttel, Steven Heller, and Paula Scher. It was opening night of AIGA’s national conference in New Orleans, in 1997 – my first and my most memorable. And an idea hit me. Why not start an AIGA chapter in Charlotte? We have a mature and inspired design community. Let’s do it. The next week I called AIGA headquarters and asked: “What does it take to start a chapter?” The woman in New York said to simply get 20 people to sign a document of intention. Professionals who are willing to roll up their sleeves and make it happen. A few days later, the paperwork arrived from New York. In the meantime, I called on a roster of the best designers in Charlotte. Of the 21 calls, I received 20 overwhelming “yes” responses. Two months later we all gathered at Cadmus Communication, a local printing company, host for our short but monumental meeting. It was early evening. We had all come directly from work. The smell of ink hung in the air from that day’s press-runs. There was a great energy in the room. A nice mix of designers – some who had been in Charlotte for 20 years – as well as young, newly-minted-from-school designers. There were also a few others who represented industries related to design. 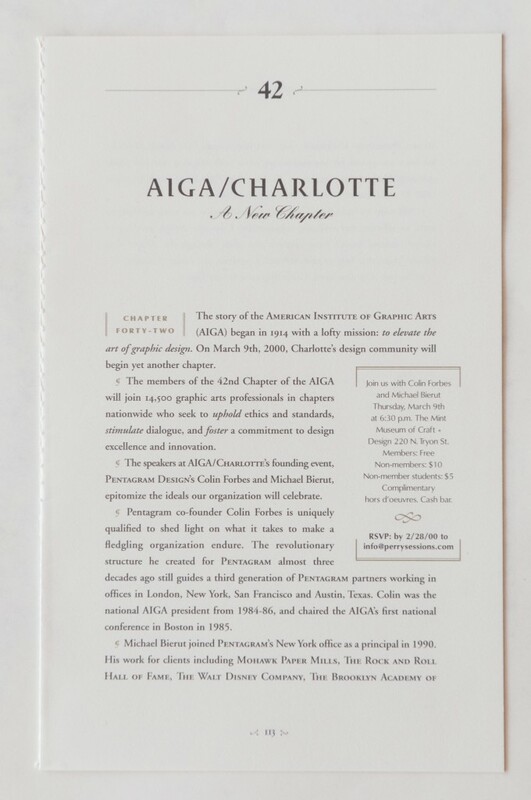 We signed the “document of intent” and concluded the evening with a toast to the future of AIGA-Charlotte. The first meeting was critical. The event needed to feel significant and substantial. With the help of Brady and Shannon Bone, Patrick Short, and Gale Haruta, an invitation list was prepared. The ideal venue was sought out. And a bit of buzz was initiated. Our group got the word out that “AIGA is the oldest and largest professional group in the nation for designers.” Basically: you don’t want to miss out. The evening was nothing short of anything I had hoped for. The room was packed with 125+ people attending. It was a beautiful fall night. Our venue was 220 Tryon Street, a historic landmark building of Charlotte and home of the Mint Museum of Craft+Design. Its glass-paneled garage doors opened up to a grand terrace overlooking downtown Charlotte. Surrounding the room, Gale created striking 4 by 6-foot posters that looked like pages from a book and described AIGA and the birth of this group. Michael Beruit and Colin Forbes were our keynote speakers. Michael was the President of AIGA National at the time, and Colin was one of five founding partners at Pentagram and an AIGA Medal recipient. As Michael and Colin entered the room the energy level went from high to out-the-rooftop. They were charismatic and charming. They commanded the room yet at the same time were approachable and genuine. It was such a special night. A perfect way to launch this new chapter. And that’s how AIGA Charlotte began. I’ve never heard this story. Thanks for sharing Karen. It’s such a sweet beginning to a chapter that has done some pretty amazing things & will in the future as well.